After five days of riding and three days of family fun with one and all, it was time to ride home. The route for the ride home I had “scouted” twice previously when we took our Fiat 500 Sport to the Bay Area for a visit, so for this I did not really need even a map. Things did not start well, and this will give my friends a laugh. I was sitting on a bench outside a body shop late in the afternoon Friday, where I often watch traffic go by while smoking my pipe. When I got back to Dorine’s I realized I had left my antique flip phone on the bench. Oh no! On the one hand, for much of the ride home I would be on the upper coast of California where there is no cell phone coverage, so any cell phone would be useless. As my brother-in-law pointed out, it might be time to upgrade anyway! I replied “Blue, and it’s a flip phone.” He returned my phone with a laugh and my aim to have the last working flip phone in America was back on track. There are a couple of “short cuts” to get from Los Gatos to Highway 1, but the most practical idea, and by far the most scenic, is to ride south on 17 over the big hill (which I have learned is called the Santa Cruz Mountain Range – probably the most hyperbolic use of “mountain” ever) to Santa Cruz, and then through Santa Cruz to head north for San Francisco. I paused for breakfast in Santa Cruz at a McDonald’s, and had a lovely reminiscence from my youth. I parked next to a newish Triumph Bonneville and went inside to enjoy bad food and good conversation. 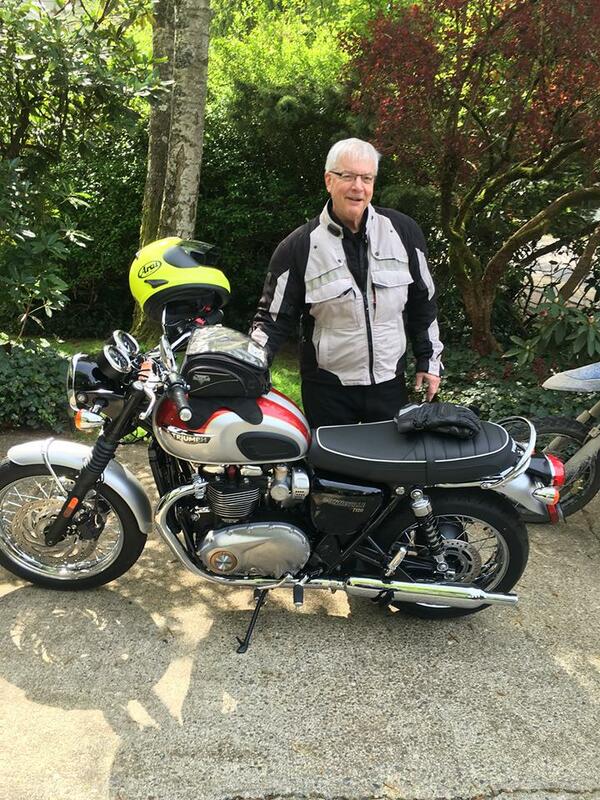 The rider turned out to be a young man in his 20’s who had owned the Triumph, his first bike, for about one month. I’d noted the scrapes on the front fender, so he had evidently gotten his first minor crash out of the way. As we chatted, or I tried to, I realized he was so new at this he was not used to motorcyclists falling into immediate conversations with others they have never met. He seemed really shy, and not sure if he should speak or not. Or maybe he was daunted by my extreme age. Or my personality. Or all three. He reminded me so much of myself with my first bike. Like him, I was not confident in speaking to other motorcyclists, lest my utter lack of knowledge about what I was doing be evident. For his part, he was so new to this that he did not know what a Triumph Speed Triple was! On the other hand, they are not very common, and I did not see a bike like mine anywhere on this trip. As our conversation waned, I noted the brand new mid-range helmet, the economy black leather jacket, the high end AlpineStar gloves, and the sturdy work boots. At least he was pretty well geared up. He was just out for a ride on a Saturday morning, just as I’d been almost every week 50 years ago, although on a much less capable bike. We bid our farewells and he strolled outside to ride away. I saw two people put on helmets, start the bike, and ride away – him today and me a long time ago. Highway 1 arcs around Monterey Bay as it works its way toward San Francisco, and was blissfully free of traffic. By 9am I had worked my way through some residential areas of the city and crossed over the Golden Gate Bridge to pause at the scenic vista parking area on the far side. Here I chatted with a father and son from Shoreline, who were on a similar but longer trip than mine. The 3rd member of their group had gotten separated from them and lost on the way over the Oakland Bay Bridge (this is very easy to do) and now the two of them were deciding to opt for Highway 101 instead of 1 to make up time and make hooking up with their AWOL friend a bit easier. Later in the afternoon I caught up to the three of them on the section where 1 and 101 coalesce. Just past the Golden Gate you turn left and Highway 1 sneaks its way toward the coast on an incredibly twisty section of road which was pretty much ruined by a lot of weekend traffic. Both times Susan and I did this in the Fiat it was a weekday and much more fun. I paused at a viewing spot above Muir Bay and took in spotter installations put in during the early days or WWII, when there were fears that San Francisco Bay would come under attack. Later, I caught up to a group of vintage scooters – the “Black Sheep” scooter club – on an outing. Their “caboose” was a fellow on a 1960’s BMW, and they were rollicking along with all due haste, which is to say – not much. I trolled along behind them for a while, drinking in the heady fumes of small two stroke engines, and then rollicked by them and up to the small town of Tomales for lunch. Evidently Tomales is where all the bike groups ride on a Saturday to have lunch and turn around. I sat outside with a tri-tip sandwich and enjoyed watching small groups of Harleys, sport bikes, and scooters come in and depart. I noticed that Tomales was large enough to have a post office but too small to appear on any of my maps. Further north, I came upon a small bevy of sport bikes going along at a slow rate. There was now enough traffic that they did not have much choice, and the scenery made going slow a great idea. However, the last guy was taking one hand off the handlebars and making videos with his smart phone. Eek! I wanted to get away from him before things went pear shaped, so I pulled off at “Duncan’s Cove.” The views were spectacular, and then got better when a fellow pulled up with his lady companion in a gorgeous Porsche 550 Spyder replica. My first assumption was that they were headed for the Monterey Historics, but their lack of luggage, a top, and windows made that unlikely, as it is often cold and wet on the coast. No, they were merely out for a scenic drive in the best replica of a 550 I have ever seen. There was no indication anywhere on the body that it was not the real thing, but an antiquated enthusiast (like me) noted the slightly wider tires as an indication of replica status. The owner confirmed my guess, but what a car! Silver paint (of course), with the leather straps to hold down the rear bodywork, and red leather buckets in the original style. Absolute perfection down to the slightest detail, and as a real 550 Spyder is probably worth a couple of million these days, an excellent choice. I want one. It even had 1956 California plates, and I am not sure how that could possibly be legal. I cruised past sights that were almost familiar from our previous trips, and reached Fort Bragg before 4pm. I had an inkling that motel rooms on a Saturday night in July might be scarce, so starting to find one seemed like a good idea. After going 0 for 4 I began to think I had made a serious error, but on the 5th stop I got one of the last rooms in the mediocre “Ebb Tide” motel. It seems that the annual Mendocino Musical Festival was going on (who knew?) which is why she had only “smoking rooms” left, on the 2nd floor – for $190 a night for one. Oh well. Past Eureka the next morning I had a delightful surprise. A large herd of elk were grazing right next to the highway on the lawn of some sort of outfitter’s store. I pulled in and parked on the other side of the driveway, with nothing between me and my bike and several tons of strolling elk meat but about 10 yards. A car parked behind my bike, and it was a 1959 Corvette. As Susan and I owned a 1958 from 1972- 75, and as the couple that owned this one were also motorcyclists, a wonderful conversation ensued. Our Corvette was a rolling wreck that we improved during our ownership with a new interior and new paint (twice) and other things, while there’s was much better, what the auction folks would call a high quality driver. Not a show car, and not perfectly stock, but usable. Perfect. So I’m cruising along on a crisp day on my Honda 450 Street Scrambler, and I come up on two guys in an old Chevy pickup truck. Just like the end of the movie. There’s a gun rack in the rear window, and it is full. Just like in the movie. The driver sticks his hand out the window and motions for me to pass. JUST LIKE IN THE MOVIE! I passed him for sure, and kept going as fast as my skills would allow a Honda 450 to go for about a half an hour. It may sound silly now, but I was very, very frightened at the time. Things were different then. I ended the day in Reedsport at the Best Budget Inn, another good choice. The proprietor was a lovely woman of Indian heritage who came to my room a few minutes later to make sure I liked it, as she had others if I wanted to switch. It was perfect for my needs, however, and with a selection of food items from the 7-11 down the street I was set. And… $60! The final day had choices aplenty. I could head up the coast into Oregon as far as I wanted, letting traffic and weather be determining factors. If either was not to my liking I would take the next small highway east to I-5 and cruise home. First goal was to ride until I found a breakfast spot, and bizarrely, this took almost 60 miles! I finally found the “Pig and Pancake” in Newport, and stuffed myself with an enormous ham and cheese omelet and the best pancakes ever. Unfortunately, the entire ride up to then had been a vast, chilly, and moist dark cloud. Beautiful in its own way as the weather shrouded the bluffs along the coast in mist, but eventually the charm wore off. I passed by Florence and the famous “Seal Caves” and wow – the odors of seal urine and excrement surely penetrate the morning air! At breakfast I decided that the weather on the coast was likely to remain in place for the entire day, so I romped over the hills on 20 to Corvallis and I-5, and then slabbed it home. The worst part of the entire trip was the last 60 miles, as the traffic between Olympia and Bothell was literally unbelievable. This is a Monday, people! Shouldn’t you all be at work? It seems that a lot of fender benders added to the jam, and my only consolation was that it was exponentially worst in the other direction – a crawling bumper to bumper horror from Bothell to well past Tacoma. None of which prevented me from arriving home with a huge smile on my face. That smile is still there almost a week later, and will help carry me to next summer, when I intend to do the same trip by different routes. This entry was posted in Marketing, Travel. Bookmark the permalink.